Ladybugs eat lots of aphids. Did we say lots of aphids? Lots of aphids. They have no portion control. If you watch closely, you'll see them gobble aphids like theater-goers devour buttered popcorn. Ladybugs eat so many aphids you wonder if they'll ever be able to lift off the plant. Last Saturday we observed the usual: a ladybug chomping down aphids. But wait! What was that riding on her back? Coud it be? Was it? It was. An aphid was riding the ladybug like a cowboy on a bucking rodeo bull. Didn't the aphid know that one little slip, and no more happy trails? 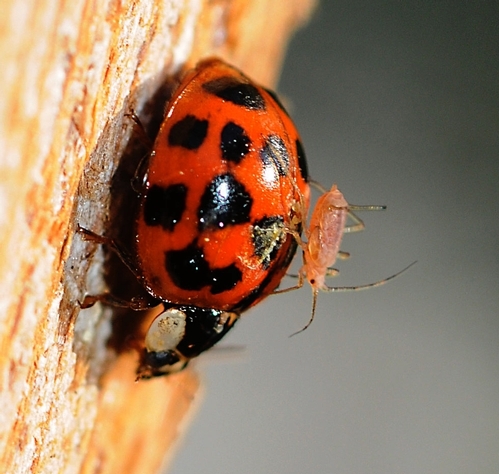 "Well," one wag said, "that's the safest place for an aphid--on the back of a ladybug."